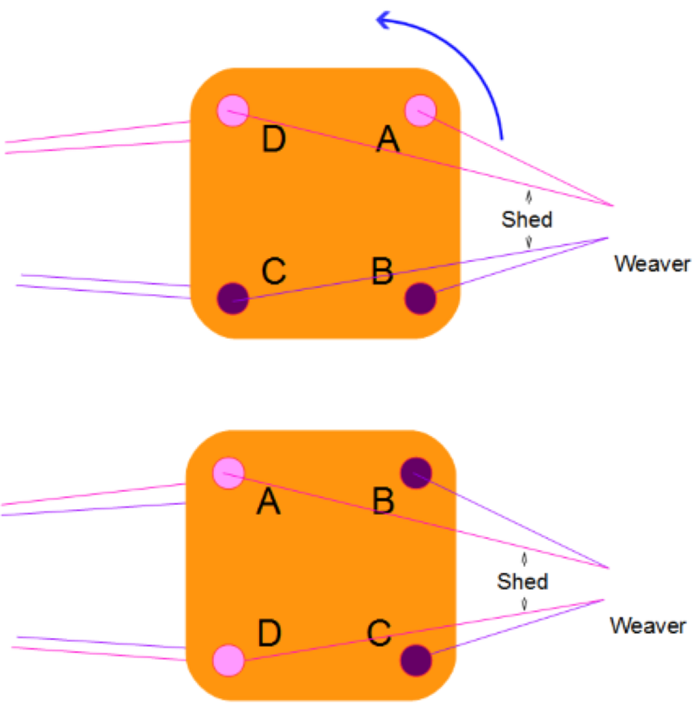 Like loom weaving, tablet/card weaving has a shed into which you pass the weft. The shed is formed by the gap created between the top two threads and bottom two threads in each card. Now here we are looking at the shed from the side and I’m showing just one card for clarity. The weft is passed through the gap in the threads closest to the weaver. If you’re a loom weaver, you’re probably thinking that this is all fairly familiar and that’s right. The principle is the same. You can see the threads that make up the top and bottom of the shed change slightly as the holes in the card/tablet are rotated. So in the first image the top of the shed is made up of the threads from the D&A holes. After the tablet is turned, the top of the shed is made up of the threads from the A&B holes.